A pizzeria with traditional family recipes dating back to the 1970's when the Mazzotta family opened up its first location called Pizza Boys. 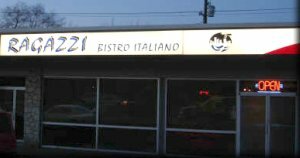 Vince Mazzotta is still at the helm along with his family David, Daniel, Andrea and Jason carrying on the family tradition of classic, delicious pizzas and pastas from the "old country" in their expanded location renamed in Italian: Boys = Ragazzi! Their expanded location is a mite hard to find, as its located in a tinny strip mall on the left side of the road just south of the Bonnydoon mall. If you shoot past it, you'll need to double back via the myriad of suburb roads. We once had to reverse for a few blocks in the winter due to all the huge icy windrows to make it into the parking lot. Heh, we were too lazy to find a driveway to do a U-turn without getting stuck in a snow drift. The service is hit and miss, highly dependant upon who's working when you walk in. Over the years, our experiences have ranged from atrocious to kind and congenial. When you open the doors, your nose is instantly hit with the tantalizing combination of warm tomato sauce, savory salty sausage and cheese... mmmmm. Black tablecloths are functional (double defense against tomato sauce blobs!) provide a casual tone to the soft pink and beige stonelike walls. A stone arch connects the old restaurant to its new expansion decorated in the same neutrals. A glimpse of someone tossing a pizza circle in the air from the kitchen in the back is obscured by the cluttered bar/counter front and centre from the entrance. With the arguably best traditional pizza in the city, its not surprising business is brisk and reservations are needed. When the majority of the Italian population recommends this venue as their first choice for pizza for their families.. who's to argue? Thin crispy crusts hold up generous amounts of toppings without succumbing to the dreaded soggy flop, with toppings lean more to traditional toppings with choices such as the Margherita and Calabrese pizzas. Though there is a nod to more conventional combinations, they have a traditional twist added to them - some artichokes here, some Casalingo salami there, or a handful of salted dried anchovies for the adventurous. Simple, unpretentious and yummmmmmy! My personal favorites for pizza? 1) Pizza Toscana - tomato sauce that has sweetness from freshly pureed tomatoes, a hit of fresh garlic, topped with addictive salty dried/fried? tasty anchovies, dried basil, oregano, chili peppers for some heat and a healthy pinch of parmesan cheese. Simple, and wonderfully executed layers of sweet, salty, savory satisfaction. You won't miss the mozzarella on this pizza! And most people who claim to hate anchovies or the idea of them on their pizza, you'll change your mind. Nomnom! 2) The Godfather's Choice pizza - the tomato sauce is thickened with a myriad of spices and chili peppers, topped with thin slices of light pink cured savory capicollo, paper thin slices of prosciutto with crispy edges, smooth and ultra stringy melted bocconcini cheese. Mmmm! 3) The Deluxe - the classic subtly sweet tomato sauce is topped with thin slices of prosciutto, spicy fatty juicy Italian sausage, a pile of sliced mushrooms, and fluffy potato-like chunks of artichoke hearts. Fresh artichoke hearts are used instead of the tangy pickled variety found elsewhere. the Baked pastas and the original Soprano bread nom! The meat used - veal, lending a stronger flavor and different texture to their meat balls and meat sauces. Can't go wrong with smothering pasta with plenty of seasoned meat, fresh tomato sauce and a mountain of melted cheese. If the boys in the back are in a good mood, and you have a few friends along for your meal, order the original Soprano bread and you won't be disappointed. A homestyle crispy spiral of bread is slathered with olive oil and baked with a smattering of Italian spices, a handful of anchovies and is just pure heaven when you bite through the crispy exterior into the soft tender interior studded with good stuff. Dunking a good sized chunk into a dish of good quality tangy balsamic vinegar adds another level of complexity and rapture-induced grins. The only surprise at Ragazzi is their pasta. While they excel at their pizzas, their pasta sauces need work. While the portion sizes of pasta dishes are generous or adequate, the sauces and toppings on their pastas are insipid and lackluster. The Linguine Alle Vongole Bianco - Fresh baby clams in a white wine sauce - barely any sauce, no hint of discernible wine and a few lonely shelled clams on top of unsalted linguine. The sauce was diluted and tasted like the chef used water and not wine. Could be vastly improved with the addition of a hefty dollop of fresh garlic, olive oil, clam broth, salt, basil or herbs, pepper and liberally douse in white wine. The Gnocchi in salsa rosa - is passable slightly chewy (manufactured?) gnocchi pasta topped off with a passable but not outstanding homemade rose sauce. Again, it can be improved with the addition of being more liberal with the seasoning and red wine. You can cook off wine to reduce or eliminate the harshness from alcohol, but you have to add in the wine to begin with for the flavors it imparts to the dishes. Quibbles - inconsistent and sometimes atrociously bad service (big minus in my books) and lackluster pastas. Despite the quibbles I have with the service and pasta, they are arguably the best in town for their delectable thin crust pizzas with top notch fresh toppings. 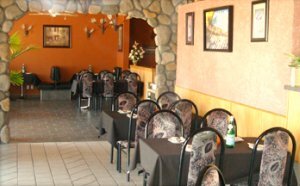 Just make sure you make reservations so you don't have to jostle with other Italian families waiting for a table.